The committee room (or board room) in the original hospital building was the location for the weekly management committee meetings. It is likely that the early meetings were held in one of the old buildings that was on the hospital site when it opened. On 13 November 1845 the committee held its first meeting in its new committee room, which was located in the central part of the main hospital building completed that year (see Dorset County Chronicle, 20 November 1845, page 6). After several other members of the Committee had spoken the meeting abruptly concluded owing to the sudden illness of Dr. Lush – Our greatly revered Honorary Physician died in a few minutes in the Board Room. A number of panels and commemorative plaques hung on the walls of the room, and some have survived. These are illustrated below (click on the thumbnails to see larger versions). In A Short History of the Dorset County Hospital, published in 1902, Captain J. E. Acland describes this plaque as “a board affixed to the wall of the Committee Room”. We have no record of when it was commissioned, but it is likely to have been one of the earliest commemorative items in the room. 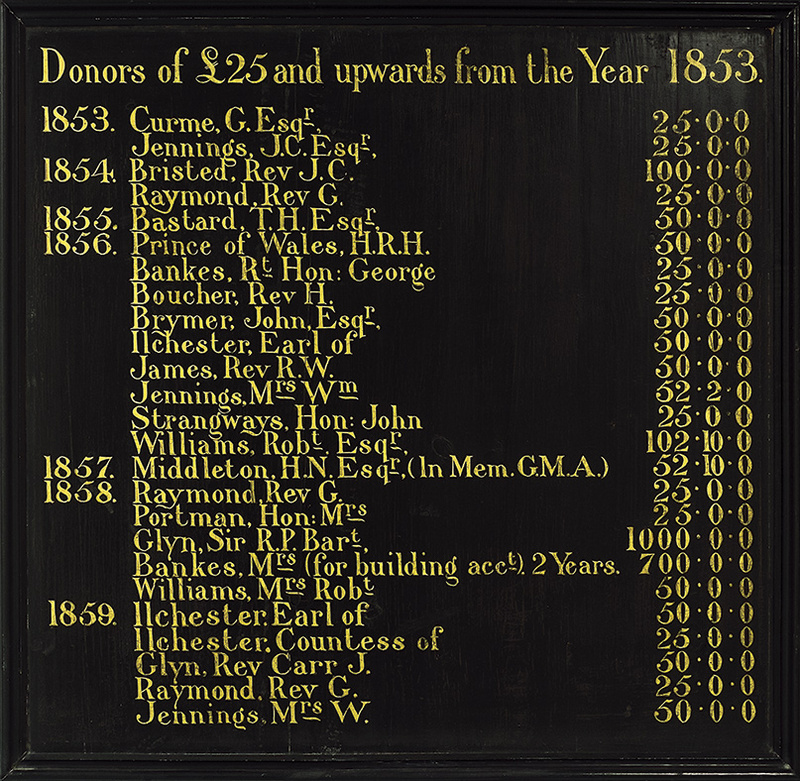 On 2 February 1852, two management committee members – Mr. John Garland and Mr. M. C. Weston – were tasked with getting costs for putting the names of donors on the panelling in gilt letters and with a black background. It seems that only the first part of the panel – covering donors from A to C – has survived. We do not have a record of when this panel was commissioned – probably in 1860. The donations include £50 from the Prince of Wales, who was to become patron of the hospital in 1866. He continued in that role when he ascended the throne as King Edward VII in 1901. The other notable donation listed is that of £700 to the building account by Mrs. George Bankes. When her husband died in 1856 he left £500 to the hospital, and Mrs. Bankes supplemented this sum with her donation on the condition that the remaining wing of the hospital be built. This became known as the Bankes wing. This panel lists those who left money to the hospital during the period 1865-74. It also records the restoration of the donor panels in 2001. This panel lists those who left money (or shares) to the hospital in their wills and it begins in 1883. It was added to at various points. On 7 April 1892 the committee agreed that the names of legators since 1886 be added to the panelled list. The legacies from 1891 onwards were added yet later (the lettering differs). Given the nature of the list, the panel is actually a record of the deaths of many of the hospital’s supporters, including John Floyer (one of the hospital’s original trustees) and Mrs. Herbert Williams (widow of the hospital’s first treasurer). Mrs. Williams bequeathed gas company shares. On 2 June 1892 the management committee ordered that the names of the physicians and surgeons since the opening of the hospital should be painted on the panel near the door on the east side of the committee room. Additional names were added later.